Hartley Glass Commercial - Splashbacks. 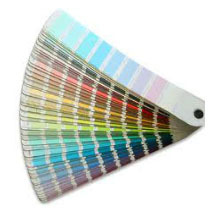 Hartley Glass install splashbacks – choose a colour from any paint colour chart. 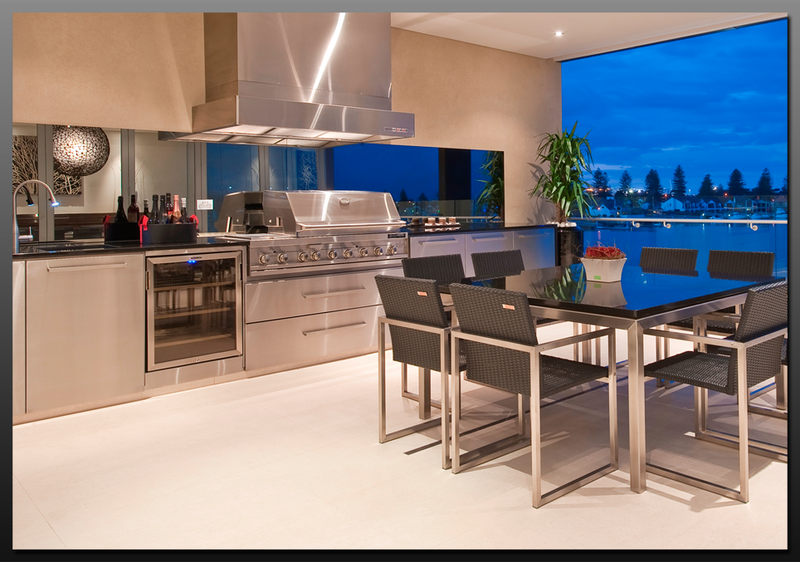 Splashback glass is being utilised in many buildings throughout Adelaide for a variety of innovative and contemporary purposes. Glass splashbacks are the ultimate choice in providing a perfect finish for your home that is durable, beautiful, colourful and easy to clean! This amazing finish is superior to tiles in so many ways. 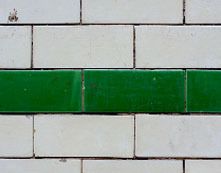 Unlike tiles, there are no grout lines or joins to trap dirt, mould or grease. 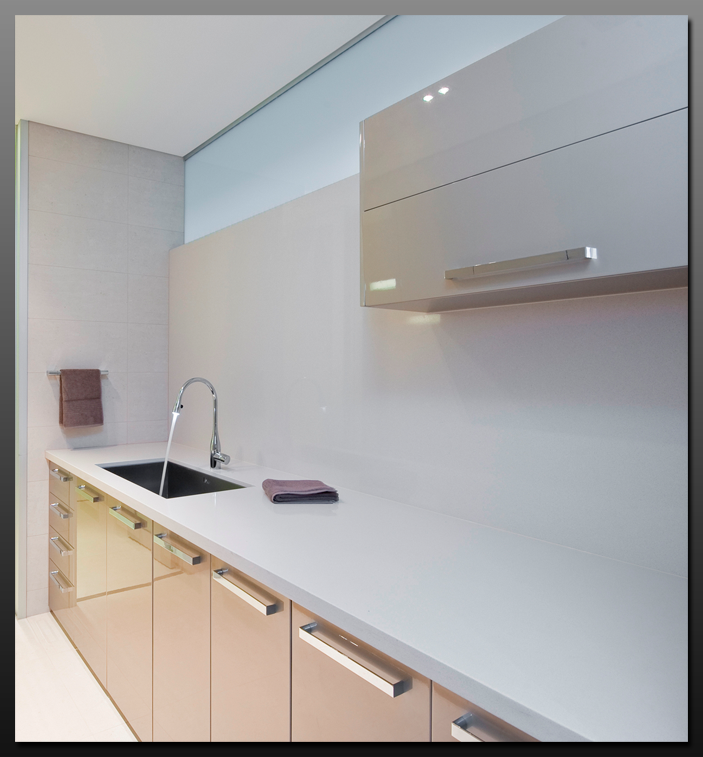 Glass splashbacks provide the ultimate in cleanliness and hygiene with cleaning being a simple 'spray & wipe'. There is an endless choice of colours to perfectly match your decor. Installations are custom sized, measured perfectly to suit and can be installed with no mess or fuss in a few hours......ready to use straight away! The reflective nature of glass provides a warmth, depth & space to your room that cannot be achieved with tiles. Our glass splashbacks are made using A-grade toughened safety glass that provides a surface that is stronger than tiles, scratch resistant & a finish that will not fade or discolour over time. 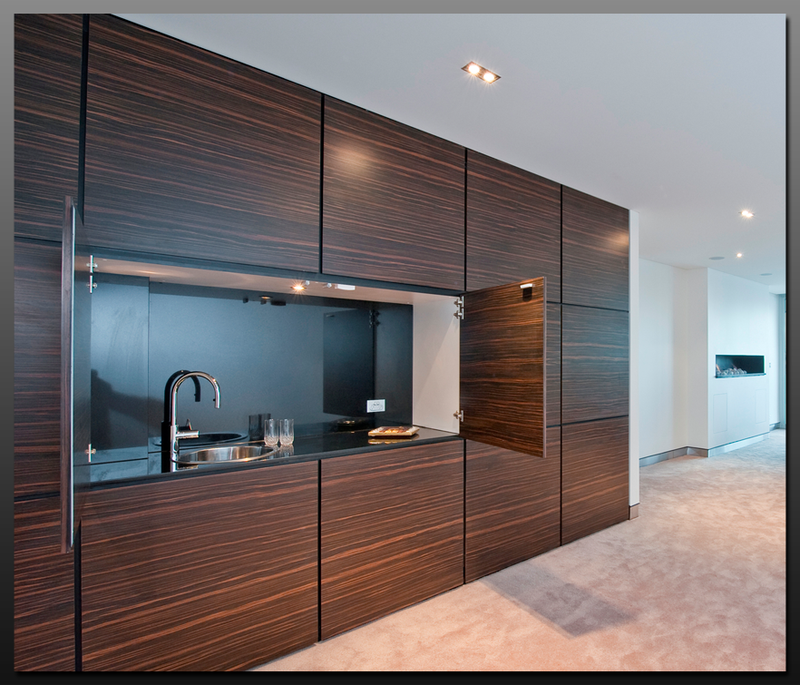 The uses of glass splashbacks are endless and limited by your imagination only. Historically, glass splashbacks have been reserved for use in the kitchen only. 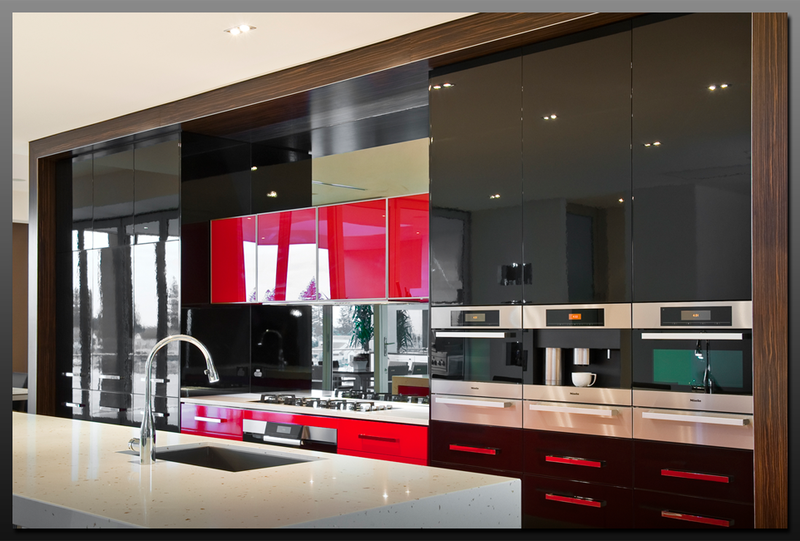 With the advancement in glass technology, this amazing finish has become a perfect choice in variety of uses where you can enhance the use of colour, add light & depth, eliminate mould and dirt build up and achieve a sophisticated quality to your home while getting the job done quickly. Other than the limitless choice of colours and the warmth, look and sense of space that glass provides, using glass in a bathroom or laundry eliminates the common problem with traditional bathrooms: mould in grout between the tiles. Glass can be used in all bathroom areas providing a hard wearing, seamless surface that is extremely hygienic and easy to clean. 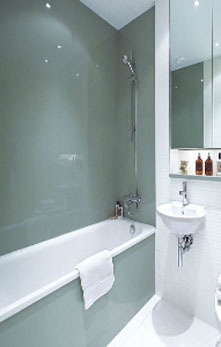 The surface is completely resistant to mould and has tremendous reflective qualities that will brighten any bathroom. With various coating options available you are able to able to design and create a unique look with no limitations. 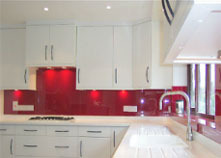 In your kitchen, glass splashbacks provide sophistication and a low maintenance practicality that is hard to overlook. Being hard wearing, scratch resistant, heat resistant and so very easy to clean, glass splashbacks are the best choice to compliment your new or refurbished kitchen. Additionally, glass splashbacks are custom made, ensuring a perfect fit, seamless finish and are installed quickly and mess free. 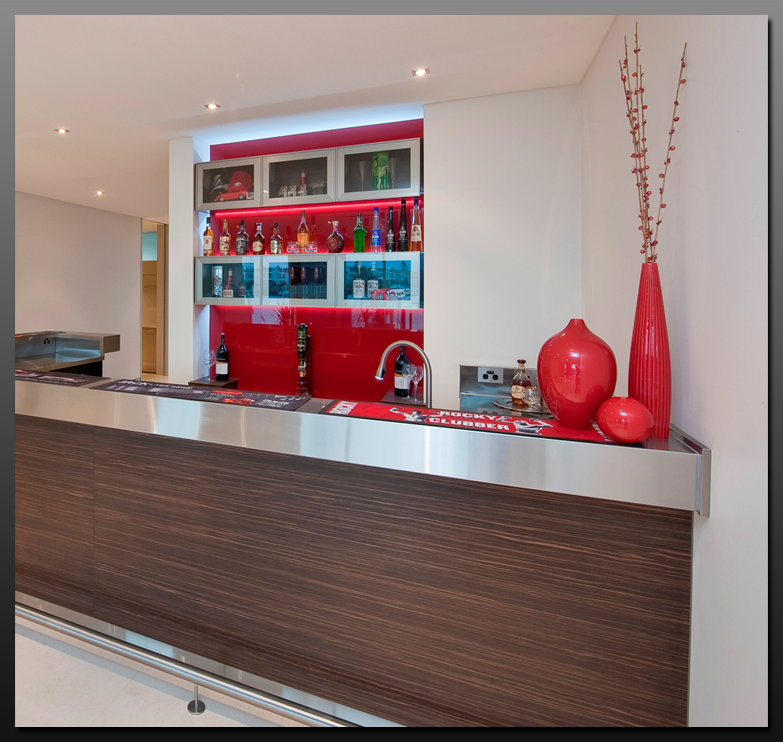 Glass splashbacks can be used to enhance your outdoor kitchen, your home bar or simply to create a unique feature wall! The uses are endless as are the colours...........let your imagination run wild! We can bring our showroom to you. BOOK NOW for a FREE on-site measure & quote where we can discuss the various options and help to inspire your imagination. CLICK HERE to book your FREE measure and quote. Our splashbacks are manufactured from 6mm A-grade toughened safety glass in either low ion or standard and fully comply with Australian Standards AS 1288/2006 and AS 2700/1996. A-grade toughened safety glass is 8 times stronger than ordinary glass and heat resistant. All your glass panels are precisely measured by our qualified glaziers, and then cut to size using state of the art precision machinery that allows for complex shapes and internal cut-outs. All edges are then polished before the glass is coloured to your specifications and then cured for 48 hours to ensure the colour has bonded to the glass. Once a final quality inspection has occurred, our highly skilled industry leading glaziers will arrive at your home and install your glass splashbacks. All our glaziers are police checked and OH&S compliant, so you can be assured that the people you are letting into your home deserve the trust you are placing in them. Our glass splashbacks can be coloured in any colour you desire from the standard Dulux colour range or we can colour match to your requirements! That’s thousands of choices of colour to choose from! CLICK HERE to go to the Dulux colour chart to assist in your colour choices. In addition to paint, glass splashbacks can be patterned using any image or graphic of your choice to create the look you desire. Alternatively, you can achieve a tinted mirrored finish. It looks like a mirror, but has the scratch, heat & strength resistance of glass. 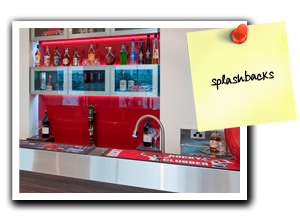 Your new glass splashbacks can be installed as soon as 14 business days from the placement of your order! We will send one of our qualified, police checked glaziers to measure and define your requirements with you, from which we can present you with your quote. Once you accept the quote and place your order, you can expect to see your new glass splashbacks installed within 14 days!! 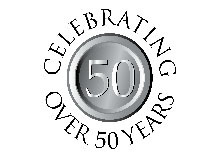 Our 5 year guarantee is fully inclusive of the glass, colour fading & the workmanship of our glaziers. This means you can get your splashbacks fully installed from as little as 10% upfront and easy fortnightly payments. Approval in as little as 5 minutes. Talk to our team today about Certegy’s NO INTEREST EVER payment plan. We will take care of the application for you so you can get your glass splashbacks installed as quickly & conveniently as possible!